Work/Life balance. Let’s just say that this is “In Progress”. My job has been pretty busy lately and on top of that, I have a work trip next week as well as 10 billion chores and errands on my To-Do list. I would like to point out that I must really love my job because I was scheduled to have a girls’ dinner date at Murray’s Cheese Bar next week. I cancelled on my friends so that I would be fresh and awake for my flight early the next morning. Let it be known that as soon as I return to the NYC-area, I’m heading over to Murray’s. One can never have enough cheese. So anyhow, what am I doing right now? I’m currently sitting on the couch at midnight on a “school night” trying to talk to you about this Thai Chicken Curry Ramen. I’m really obsessed with this dish. I’m not usually one to repeat recipes quickly, simply because I have so many dishes that I want to make. However, I’ve already made this twice in about a week and a half, which is something for me! I’ve made this both in the Instant Pot (it’s super quick!) and also on the stove. * Either method works fine, but in case you don’t have an Instant Pot then don’t worry…because you can still do this! This dish is so forgiving and you will be a star because you will have dinner on the table in no time. *If you decide to make this on the stove, add the chicken stock, coconut milk, tahini, red curry paste, garlic, ginger, chicken breast, and mushrooms to a large pot and bring to a simmer over medium heat. Continue to simmer until the chicken is cooked through, about 10-15 minutes, depending on the size of the chicken breast. Continue with the remaining steps. 1) In the Instant Pot insert, add in the chicken stock, coconut milk, tahini, red curry garlic, ginger, chicken breast, and the mushrooms. Close the lid and cook on High pressure for 4 minutes. 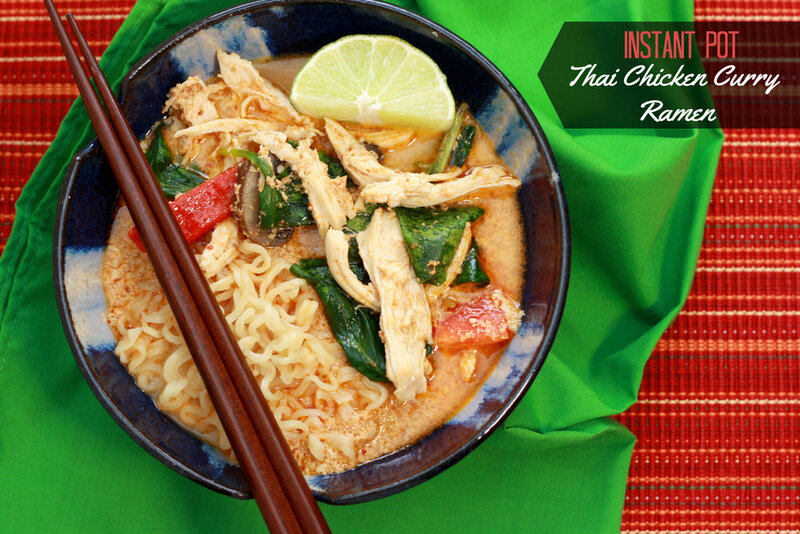 2) In the meantime, bring a medium pot of noodles to a boil. Add the ramen noodles to the boiling water and cook for approximately 3 minutes, or until the noodles are still slightly firm. Drain the noodles and divide between bowls. 3) Once the Instant Pot is done, use the quick release to de-pressurize. Remove the chicken from the Instant Pot and shred into bite-sized pieces. Place the chicken into the bowls. 4) Add the red pepper slices and the spinach into the soup. Stir well until they are incorporated. Taste the soup and adjust the seasonings if necessary by adding in fish sauce/salt, or more curry paste. Divide the soup between the bowls as well. 5) Finish the soup with fresh squeezes of lime and cilantro, if desired. Serve hot. Allow me tell you about my Instant Pot. I’ve sort of been holding out, since I actually got my Instant Pot last year in August. I’ve also been incorrectly referring to it as the “InstaPot”. I know that’s not it’s name, but it just seems to roll off my tongue faster. Sooooo I guess I’ll have to work on that. If you follow me on Instagram (if you don’t, I’m at @thehobokitchen) you may have seen that I’ve already made a few recipes in my Instant Pot. However, this is the first time I’ve actually posted and shared pictures on the blog. This is partly because 1) I’ve been using the Instant Pot mostly to make dinners, and the lighting in fall and winter evenings are not a food blogger’s friend; and 2) this is the first dish I made which I actually think tasted amazing. Now, to clarify, I think the previous dishes tasted good. The first thing we made was a pork loin with a balsamic rosemary reduction. The sauce was delicious, but the meat was overcooked. The second thing we made was a chicken and sweet potato stew. It was again tasty, but the sweet potato was overdone and essentially turned to mush at the slightest stir or touch. So this time, I learned my lesson and decided to reduce the pressure cook time by about 20 percent to improve my results. I decided that I would try a Hawaiian beef stew for my latest “test” recipe. I know that everyone is looking for the pineapple in this dish, given the name, but guess what? We don’t need to have pineapple in a dish in order for it to be Hawaiian. And I promise you that you won’t even miss it in this recipe. It’s that good. Reducing the pressure cooking time in the Instant Pot really worked for me! The meat shredded with the touch of a fork and was very tasty. Another change that I decided to make was to not use the Saute feature in the Instant Pot. I’ve found that it sometimes leads to the “Burn” notification popping up during Pressure cooking. So for this recipe, I browned the beef on the stove prior to placing all ingredients in the Instant Pot. Obviously, you can use the Saute feature in the Instant Pot if you wish, but I just found it easier to separate the processes. Either way, you’ll have a tasty meal made in almost no time. I can’t say enough good things about this dish! 1) Use a paper towel to pat the stew meat as dry as possible. Season the meat with the salt and ground black pepper. 2) Add 1/4 cup of flour to a medium bowl. Dredge the meat into the flour so that it will coat the meat. Shake off any excess. 3) Meanwhile, pour 1-2 tablespoons olive oil into a medium saucepan and place over medium heat. Add the meat and brown on both sides. You will need to work in batches, and may need to add more olive oil to the pan as you repeat the process. 4) Once the meat is all browned, add to the Instant Pot. Add in the onions, carrots, potatoes, and celery salt. Pour in the tomato puree, soy sauce, Worcestershire sauce and 2 cups of the beef stock. 5) Give everything a big stir to combine. Lock the lid on the Instant Pot and ensure the vent is in the “Sealing” position. Cook the stew on High Pressure for 28 minutes. 6) Once the timer goes off, use the quick release to depressurize the Instant Pot. Once the pin drops, unlock the lid and turn the pot to the Saute setting. 7) In a small bowl, whisk together the remaining 1 cup of beef stock and 1/4 cup all-purpose flour. Pour the flour slurry into the beef stew. The stew should thicken quickly. Allow the stew to simmer for 1-2 minutes. Serve immediately over rice. Thank the ever-loving heavens. I can't even begin to tell you how many flight woes I encountered....But once I actually made it to the correct countries, the trips were amazing! I definitely need to make sure I head back to Europe at least once a year. I've said it before but I'm really going to make this happen going forward. It's so refreshing to visit other cultures and hear about their history. While I was in Amsterdam I also did a food tour, courtesy of a recommendation from my friend. It was a very cool experience to get to eat a lot of the local food and also hear the history behind it. This Slow Cooker Beef Gyro dish is not Dutch. That's a fact. But it is quite delicious. (Can we talk about how I'm using the word "quite" very frequently these days? I'm not sure where this is coming from and whether or not I like it...). Anyhow, all that matters is that this Beef Gyros dish is super tasty and satisfying. I will be making this again this fall since I'm still kinda busy and also doing a little bit of traveling. I'm once again having a moment with slow cooker meals, so I'm going with it. Don't hate me for saying this, but I'm so so excited for Fall! I know Summer is great and all, but PSL's....I can say no more. Let's see if we can usher the new season in with this slow cooker meal. And if you just don't like Fall, I bet you will still like this meal, so get at it as soon as you can! 1) In a small bowl, whisk together the olive oil, garlic, oregano, salt, pepper, and lemon juice. 2) Add the beef to the slow cooker. Pour the seasoned olive oil mixture on top. Toss to coat the meat in the mixture and cover with the sliced onions. 3) Cover and cook on Low for 6-10 hours, or until the beef is very tender. 4) Add salt and pepper to taste. 5) In a medium bowl, combine the yogurt, cucumber, dill, salt, and garlic. Stir together until the ingredients are incorporated. Add salt and pepper to taste. 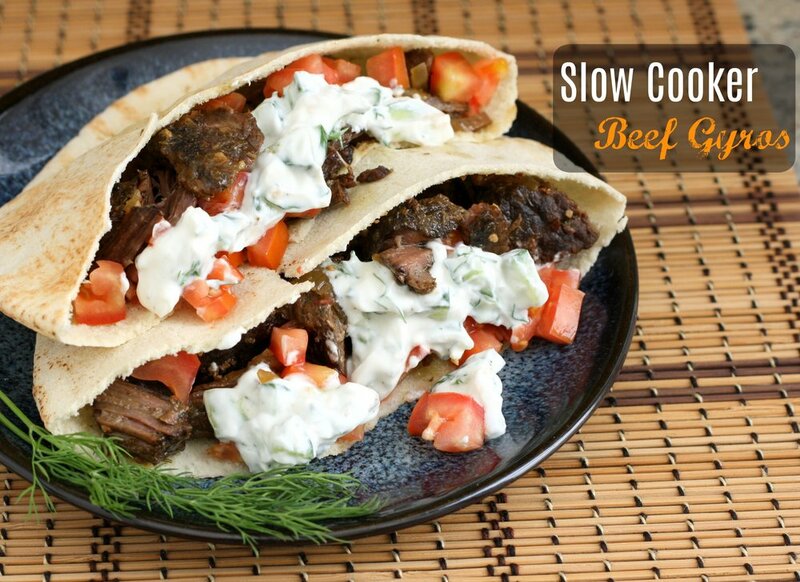 6) Serve the beef in folds of warmed pita. Add tomatoes, onions, and lettuce, if desired. Drizzle the Tzatziki sauce of the top of everything and serve immediately. In case you were questioning how much I am invested in the Fall season, I went to the gym this morning and my instructor came over to adjust my form at one point. Her first comment: "You smell like pumpkin spice." Why yes I do. Thank you for noticing! In pure seasonal bliss, I picked up some pumpkin spice coffee creamer to ensure that I'm starting my day off right with some of the season's best scents and flavors. I know some people (i.e. one of my best friends) absolutely hate all things pumpkin and seasonal but it's basically the reason I don't mind exchanging warm summer days for cooler temps. Speaking of cooler temps....Just like that, we're into October! It was cooler a few weeks ago but now we're having some 80 degree days. I'm not upset about it. As long as it's not heating up to the 90's I'll manage. Never fear, I have pumpkin and squash recipes planned for the very near future. I also have an upcoming trip and a few weekend activities planned soooo I'm not sure when everything will be posted, but just know that they're definitely coming. 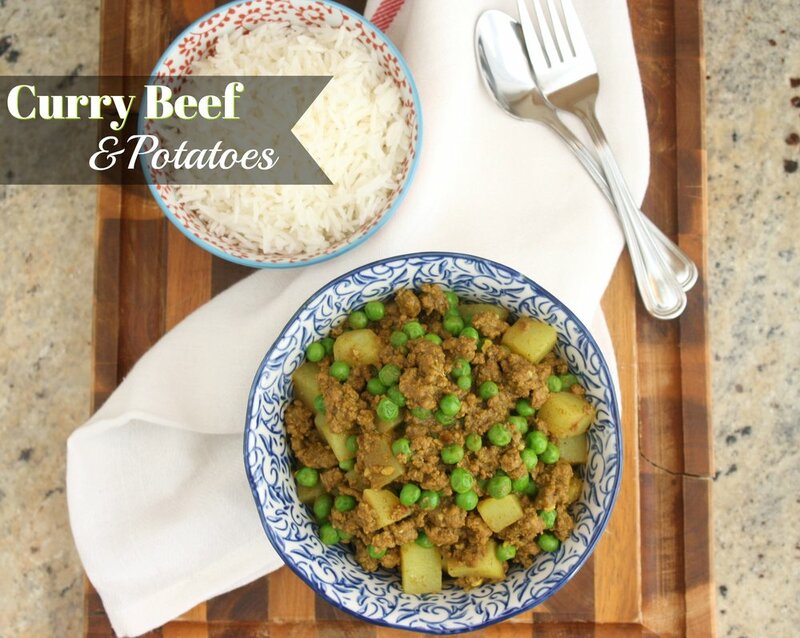 In the meantime, I'm just easing into the swing of things by turning out a flavorful curry beef and potatoes meal. Just to start dipping our toe into the new season. 1) In a large saucepan, add the vegetable oil over medium heat. Add the garlic and allow to cook for 2-3 minutes, or until softened. 2) Add in the ground ginger, curry powder, turmeric and red pepper flakes. Stir to mix together and allow to cook for another 1-2 minutes. 3) Place the ground beef into the pan and cook until fully browned, making sure to break up the meat into smaller pieces. 4) Add the potato pieces to the beef mixture, as well as the broth and the flour. Stir everything together, cover, and let simmer for 10-15 minutes, stirring occasionally. Then uncover and allow to simmer for another 1-2 minutes, or until the potatoes have softened. If the broth evaporates before the potatoes are done, add a little bit more water or broth and allow to continue cooking. 5) Pour in the frozen peas and allow to heat through. Add any additional salt or pepper, to taste. Serve hot over rice. I just got back from Canada (ok, like a week ago, but that's the same right?) and it was so much fun! I haven't been to Canada in a number of years when I was there before for my cousin's college graduation. This time it was just me and a friend. We did all the things, including visiting the Toronto Islands, eating in Kensington Market, and trekking over to Niagara Falls. Something we made sure to do while we were there was to check out the Asian food. Apparently Toronto is supposed to have really good Asian food. As we were eating everything in sight already, I only ordered a vermicelli noodle dish (which I quickly ate ALL of) and it was so so delicious. Basically, I've just been craving Asian food flavors again. 1) Pour the oils into a large saucepan over medium heat. Add the chicken and cook until done all the way through, making sure to crumble the chicken into smaller pieces. It should take about 4-5 minutes to cook. 2) Toss in the onions and cook for another 5 minutes, or until the onions are softened. 3) Add in the garlic and ground ginger. Stir together and cook for about 1 minute. 4) Pour in the coleslaw mix. Add the soy sauce and black pepper as well. Stir the mixture gently, making sure that the chicken mixture combines evenly with the coleslaw. Cook for 5 minutes, or until the cabbage wilts the desired amount. 5) Before serving, sprinkle with sliced green onions and sesame seeds, if using. Place the extra soy sauce on the side if desired. I have a new obsession. You may have heard of it. It's called biking. When I was in NOLA, my friends and I signed up for a bike tour and it was honestly the highlight of my time there. (Side note: If you are also heading to NOLA, I highly recommend Flambeaux Bicycle Tours. Take a tour with Eric!) I came back to Hoboken and immediately signed up to use our city-wide shared bike program. I've been meaning to do it for the past two years but of course I needed an extra push in the right direction. With my newfound wheels of freedom, I decided to take a leisurely ride to my neighborhood ShopRite to pick up a roast and a few other items. Am I the only one who loves grocery shopping? As I first started getting into cooking, I would head to ShopRite to find ingredients and it was there that I really grew to love picking out produce and stocking up on pantry items. Yes, this might seem weird to a few of you, but I KNOW some of you get me. And since I was so accustomed to the large selection in my big-box grocery store, shopping in smaller places nowadays just doesn't give me the exact same feeling of excitement. I just love ShopRite so much! OK, before things get weird (aren't they already weird though? ), let's just stop there. Suffice it to say that I am excited to be in full-on biking mode for the summer and I'm looking for any opportunity to take a bike ride through Hoboken. Guess that means you'll be seeing even more posts about ShopRite in the future! 1) Add the onion, garlic, tomato paste, and oregano into your slow cooker. 2) Season the beef with as much salt and pepper as desired. Add the meat to the slow cooker as well. 3) Pour in 2 cups of water, cover and cook on low for 9 hours (or high for 4 1/2 hours). 4) Once done, use tongs or forks to shred the meat. 5) Serve warm on top of rice, mashed potatoes, polenta/grits, etc. Before you decide that there are simply too many ingredients in this recipe....hear me out. I, too, felt that way at first glance, but then as I took a closer look, I realized that this is sort of a plug-an-play situation. What I mean is that there is little prep for this dish. Honestly...you dice half an onion and a sweet pepper and that's all the work needed. Come on now. Come. On! I am the epitome of a "laid back blogger". You probably already know that I work a 9-to-5 job. However, things have been a bit hectic at work recently so I've actually been dialing things back over here. I have no plans to stop blogging anytime soon. I've actually been making quite a few new recipes chez moi, but just haven't had the time to post yet. So anyhow, I say this to let you know that this recipe IS actually very easy to make and I totally recommend doing just that. I slightly tweaked this dish from How Sweet Eats since I felt the need to add in a few more seasonings and also add in corn. What's a summer without some good old corn? Nothing, I tell you. Full disclosure - this is frozen corn, BUT you can definitely use fresh corn if you have some on hand. I didn't (bad food blogger!) so I had to improvise. All's fair in the kitchen! 1) Heat a large saucepan over medium heat. Pour in the olive oil. Once warmed through, toss in the onions, bell peppers, and the garlic. Saute until translucent, about 2-3 minutes. 2) Place the beef in the skillet and allow to cook until browned, 6-8 minutes. Make sure to break up the beef in order to cook the meat evenly. 3) Meanwhile, in a small bowl, combine the chili powder, cumin, paprika, onion powder, cayenne, seasoned salt, salt and black pepper. Add the spices to the saucepan with the beef and stir well to incorporate. 4) Add in the green chiles and the frozen corn. Stir well. Cover and cook on low heat for about 5 minutes so the flavors can all come together. 5) Remove from heat and serve over rice. Serve with avocado and/or sour cream on the side if desired. Sooooo, you know when you're supposed to get a thing done but then life gets in the way and you definitely did not do what you were going to do? Yeah, that's this blog post. My fault! But I'm here now. I'm really excited about this recipe because it was quick and easy and really tasty. I've never made kielbasa before, which is surprising, given that I spent over 5 years living in Pittsburgh. Fun fact: Pittsburgh has a huge Polish community. Shockingly, I think I've probably had kielbasa itself only a handful of times. So this recipe is way way wayyyy overdue. Another fun fact: I thought I didn't like sauerkraut. Um, no, I apparently love sauerkraut. This is a thing. Let's make this new-to-me thing together. There are 4 ingredients, so you absolutely have no excuse. Let's do it! 1) In a small pan over medium heat, add together the beer and brown sugar. Stir together until the sugar melts and the mixture thickens slightly. Remove from heat and set aside. 2) Slice the kielbasa into links and add to the slow cooker. 3) Drain the sauerkraut and place it on top of the links. 4) Pour the beer and brown sugar mixture over everything. Cook on High for 4-6 hours, or on Low for 8-10 hours. 5) Serve as desired (by itself, over rice, or on a sandwich roll). Step 1: Purchase pork. A few days later, realize that pork is no longer good (even though expiration date is days away). Step 2: Walk to two different grocery stores trying to find and re-purchase pork. Step 3: Trim the pork. Cut into chunks. Step 4: Add to slow cooker. Toss in all the spices in your pantry. And there you have it! 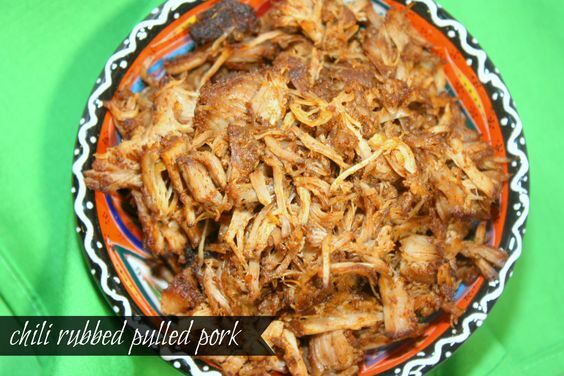 You just made this pulled pork a real thing. Go on with your bad self. Well, it's officially Fall weather. Again. We went from 80 degrees this past week to a high of 50's and low 60's this weekend. So basically I got to relive my sweaty summer self (super cute!) and I also got to pull out a few plaid shirts, my leather jacket and humongous scarves. I've also been fighting a little cold this weekend so I really wanted to make something easy and quick. Ain't nobody got time to hang out in the kitchen for hours. Even when I'm in peak physical condition (ha ha!) I'm always on the hunt for a quick weeknight meal and I think I found the perfect one! I haven't made anything Asian-inspired in a hot minute. Let me switch it up right now. 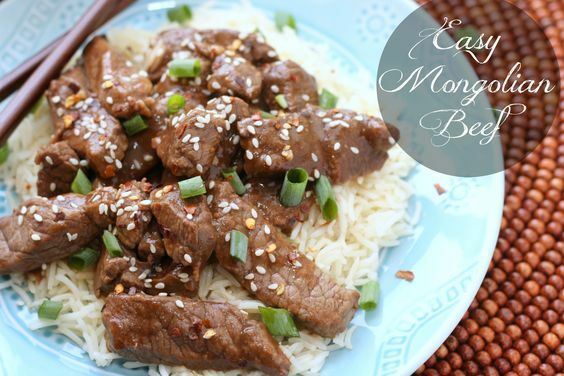 This Mongolian Beef dish was super quick, simple, and easy to make. Now, there are quite a few ingredients listed below, BUT that was because I didn't want to run to the store to purchase hoisin sauce. I had a few items which were a good substitute in my pantry already so I made an executive decision. You couldn't even tell the difference!